Sangaree (1953), an historical melodrama starring soon-to-be-marrieds Fernando Lamas and Arlene Dahl and filmed in 3-D, isn't exactly good, but it's restoration and release for 3-D Blu-ray format is nonetheless most welcome. One of the first 3-D titles of the ‘50s craze, it was Paramount's first 3-D movie, and opened on 27 May 1953, mere weeks after the first Hollywood studio-made depthies, including Man in the Dark and House of Wax, had premiered. The rush to get this out apparently resulted in various problems, as informatively reported on the disc's extras. A 3-D version wasn't ready in time for the sneak preview, and various production and printing problems, to say nothing of age and neglect, made it an especially challenging title for the 3-D Film Archive, the wonderful little firm that's done many of these fine restorations. Based on what they started with, elements sampled on the disc's restoration demo, that they were able to squeeze out as good a presentation as they did is nothing short of miraculous. It's still a little problematic, but still very good considering. The movie itself is faintly silly and inconsequential, flatly directed and short on action, and leading man Fernando Lamas's once exotic screen charm today plays almost like camp (Billy Crystal's famous imitation of Lamas on Saturday Night Live in the 1980s cementing this view). Still, 3-D film buffs like this reviewer are genuinely grateful for this release. That it's not very good hardly matters. Soon after the Revolutionary War, beloved General Victor Darby (Lester Matthews), on his deathbed, compels Dr. Carlos Morales (Lamas), the lowly son of indentured servants, to assume control over his Georgia estate, Sangaree, rather than the more obvious heirs, son and daughter Dr. Roy Darby (Tom Drake) and Nancy Darby (Dahl). Roy has no objections, as he admits to having no head for business, but Nancy is offended by the appointment. It also presents problems for Roy's wife, Martha (Patricia Medina), with whom Carlos once had a torrid affair, and whose candle still burns for the Latin lover. Meantime, the county is plagued by pirates and plagued by plague. Martha, eager to cause trouble, blames the former on Nancy, suggesting that she's in league with notorious French pirate Felix Pagnol (Charles Korvin). An outbreak of the plague spurs Carlos to have every warehouse checked, but pompous wealthy physician and merchant Dr. Bristol (Francis L. Sullivan), insulted by Carlos's appointment to the local council, will have none of that. Ads for Sangaree likened it to Gone With the Wind, but it's a modest, lower-end "A" picture with average production value. The main conflicts driving the plot, the Carlos-Nancy-Martha love triangle, the business with the pirates, and the threat of a plague epidemic, just sort of hang there, with the script lurching from one to the next without much cohesiveness. The subplot connecting Pagnol with other characters basically goes nowhere, while the threat of plague is intermittently discussed with no one taking any real action until the climax, giving the threat a curious lack of urgency. Russian-born director Edward Ludwig made nearly 100 features between 1921 and 1963, few of them distinguished. Among his better-known films: Swiss Family Robinson (1940), The Fighting Seabees (1944), Wake of the Red Witch (1948), Jivaro (1954, also in 3-D and starring Lamas), and The Black Scorpion (1957). Sangaree is unimaginatively directed, with most scenes "covered" with a master shot and a few close-ups, so that a five-minute scene plays out in its entirety with just four or five different angles, used repeatedly. Unlike most of the ‘50s 3-D titles released to Blu-ray thus far, Sangaree uses the format conservatively and, again, unimaginatively. That there's so little action until the climax (limited to a barroom brawl and an attempt to blow-up the pirate ship) makes Sangaree feel unusually stagnant. The overuse of rear-projection process shots only adds to its staginess. Arlene Dahl is undeniably beautiful but here plays a woman who's little more than pig-headed, while Lamas, despite all that oozing Latin charm, is rather stiff and uninteresting. Probably the film's best performance, though again the character is a cliché, comes from Francis L. Sullivan, the corpulently fat English character actor whose strange career peaked in numerous great British films of the 1940s (such as Great Expectations and Oliver Twist) before he moved to Hollywood near the end of that decade. His early roles in the U.S. were generally good (in such films as Joan of Arc and Night and the City before turning to junky movies like Drums of Tahiti and Hell's Island. He died in 1956. Sangaree began production as a regular 2-D film then switched to 3-D as the craze gained steam. As noted in the extra features, it was shot on single-strip Eastmancolor negative, which was then processed by Technicolor as a three-strip dye transfer. However, there were numerous problems with the opticals (fades, dissolves, etc.) which, if I understand this correctly, looked grainy and presented alignment issues even then and which have faded even further in the 65 years since its release. It appears the original camera negative was used for the right eye image, while a 30-year-old interpositive was sourced for the left. Bringing back the color while also fixing the various problems was an unprecedented challenge for the 3-D Film Archive, but the results are impressive. Mostly the results are excellent: the picture is still rather grainy because of all the dissolves and fades, but the color has been brought back to a good approximation of Paramount's house style for their Technicolor films of that era. The picture may have been exhibited cropped to 1.66:1 widescreen in some theaters, but it was definitely composed for 1.37:1 and that's how it's presented here. The DTS-HD 2.0 mono is quite good for what it is, and the disc is region "A" encoded. Supplements include a Restoration Demo in 3-D itself, which is highly informative and interesting. Also included are two trailers, both in 2-D: one announcing the 3-D release, featuring original footage of Dahl and Lamas amusingly trying to explain the process, with the other a more standard 2-D trailer. 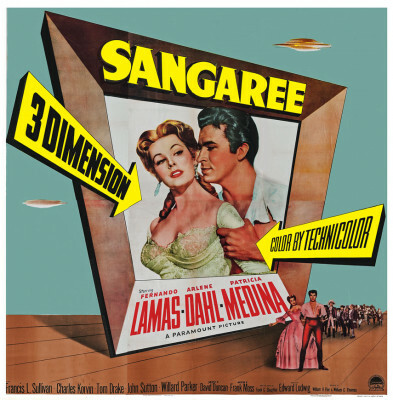 Finally, there's a Lux Radio Theater broadcast of Sangaree starring Dahl with Cesar Romero playing Lamas's part. While definitely not the 3-D Blu-ray title I'd reach for to show off the process to friends, Sangaree nonetheless moves us one step closer to seeing all the 1950s 3-D titles out in 3-D Blu-ray format. While not very good, I'm very glad to finally have the opportunity to see it looking as good or better than it did in 1953, and grateful to the 3-D Archive for the hard work they put into this release. For those interested in such films, this is Highly Recommended.